Taylor Swift is one of the most popular singers among teenagers nowadays, and this song is a hit. There´s a videoclip that is amazing, you can easily find it in Youtube and use in class, it tells a story of a romantic girl and her silly neighbor. The song can be used for any age, but I´m sure teenagers will love it!!! It´s a worksheed based on Keane´s Somewhere only we know with a multiple activity. There´s a different task for each part of the song, so the exercise won´t be boring. This song can also lead to a discussion about what we´re looking for in life. I suggest folding the sheet before giving them to students, so they won´t read the full lyrics. 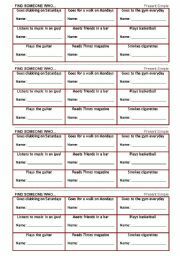 This is a very simple activity, that can be used after a short break or with a new group of students. As there are some deep questions, I´d rather use it with older students. You will need a bag of m&Ms (os skittles) to do this activity. Traditional find someone who activity where students should use questions to check who did those things, I also suggest a follow-up question to make it more challenging. 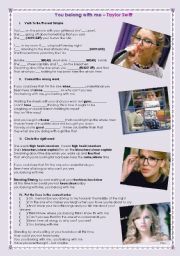 This is a very simple activity for students (teens or adults) that love the successful Tv show Glee - I love it!!! 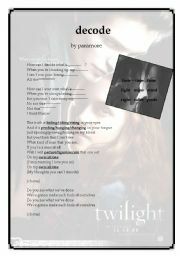 This is an worksheet based on the song Decode by Paramore, which was in the soundtrack of the popular movie Twilight. 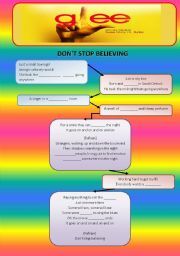 It´s a must for all those who teach tweens. 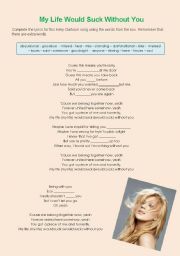 I prepared an activity for this song which is being currently played on MTV and I decided to used gaps and pairs of words with similar sounds so Sts will have the chance to tune in their listening skills. 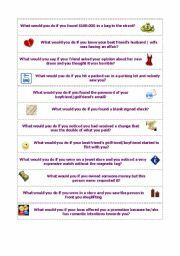 This activity should be printed and cut out in strips. Teacher can put them in a box and students can raffle them and answer the question using conditional structures. 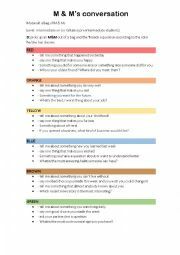 I suggest sts to make follow-up questions in order to keep up the conversation. 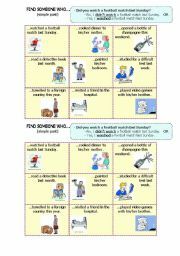 This is a simple find someone who activity where Sts should mingle around the class trying to find someone who does especific activities and write their names on the card. Each printed sheet will be cut and used by 4 students. For conversation matters, I usually motivate sts to ask a follow-up question.